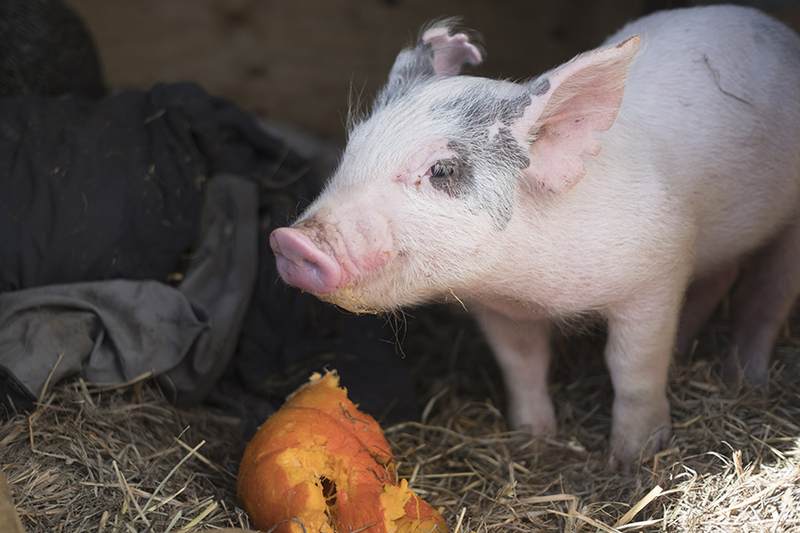 Mac, or Mac Attack as we fondly call him, is a vibrant, charismatic piglet saved from slaughter. 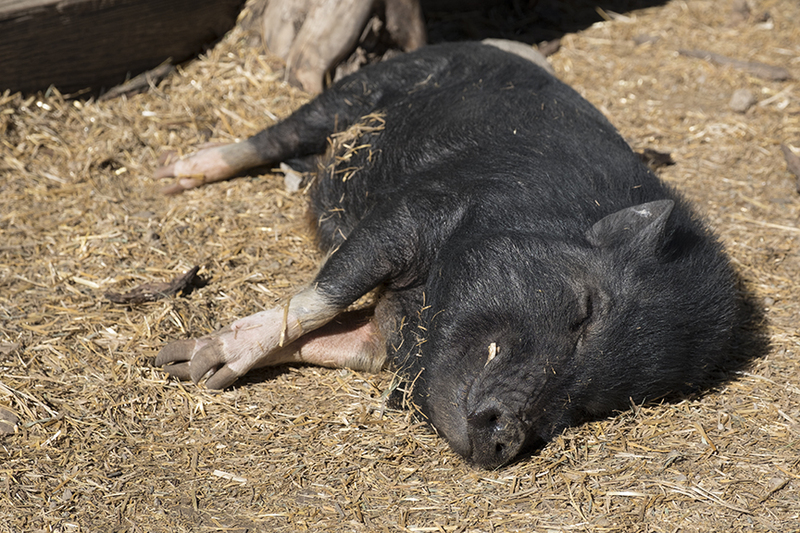 His former owner purchased him at auction to raise for meat, and had a change of heart, allowing him to come to our sanctuary to live out his life. Mac radiates happiness and energy, and prefers to run, not walk. His best friend is Morty, and we refer to them as the odd couple! Mac will grow up to be a big boy, probably close to 900lbs, and will eventually move in with Lucky as he gets bigger. Morty had a very rough start to his life, being severely abused by his first family. Morty was rescued by two brothers, and lived with one of them in Durango for a year. 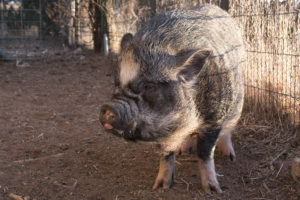 Unfortunately, his new owner was unable to provide for Morty, so he was brought to Hog Haven to live his life and make friends. Morty is deaf, has some neurological problems, and lives in the pen closest to our house with his buddy Mac. He is a very hard pig to take pictures of, as he is always moving around! He loves to spin circles, and has one of the most impressive mohawks of all the pigs. We just love this guy! You may remember our January 2017 post about Lucy’s transformation. 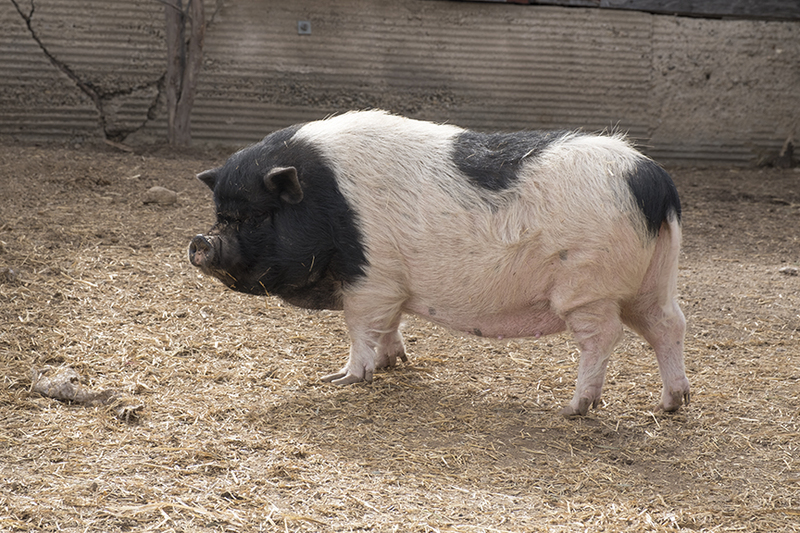 Lucy came to us in 2014 as a severely obese pig; her eyes were obscured by fat pockets, and she had very low energy. Fast forward two years, and Lucy has blossomed into a healthy, happy piggy! She lives in our main pen with 20 other pigs, but she enjoys spending time with Lincoln, Lotus, and the two Penelope’s. She is the first to hustle to the fence when visitors come by, and enjoys a good belly rub! Because Lucy had a lot of weight to lose, we decided she would be a permanent resident. Pigs form very strong bonds with their human companions, and after a few years, putting her in a new environment would be too stressful for her. 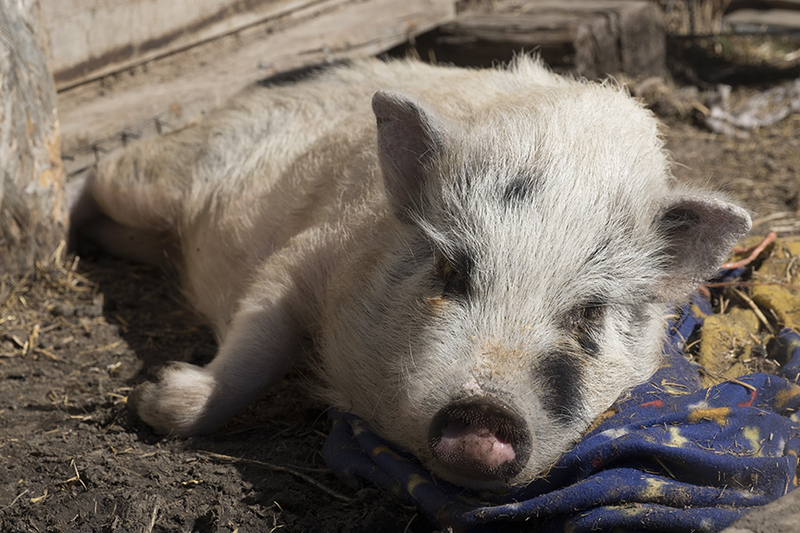 Dug had a rough start to his life, and his owners were unprepared for housing and caring for a pig. He came to Hog Haven Farm late summer 2016, after a big effort was made for transport and payment. A wonderful volunteer named Doug drove from Arvada to Pueblo, to Deer Trail then back to Arvada, just to save this sweet boy. We named him Dug after that kind man who made his rescue possible. After a short time, it was apparent Dug hadn’t been treated very well by people; he was terrified of everyone, and it took some time for him to start trusting Andrew and Erin, and other people. You can see by the picture he has come a long way, allowing our friend Debbie to feed him a carrot! Dug lives with two potbellies, Herschel and Jimmy, and is on our list to be neutered this spring. 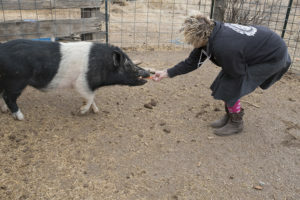 Chopper came to Hog Haven Farm in 2015, surrendered after a bitter divorce. He was 4 years old, and had a really strong bond with his family. His arrival at the farm was probably the most heartbreaking for us to witness; he was very depressed for a period of time, not interested in anything. His arrival showed us that pigs grieve, and they can actually cry. Chopper started to gain our trust, however, and befriended Truffle, a cute little lady who arrived around the same time. Because his acclimation to the rescue was so difficult, Chopper is a permanent resident. He loves to sunbathe, and he almost always has a smile these days! 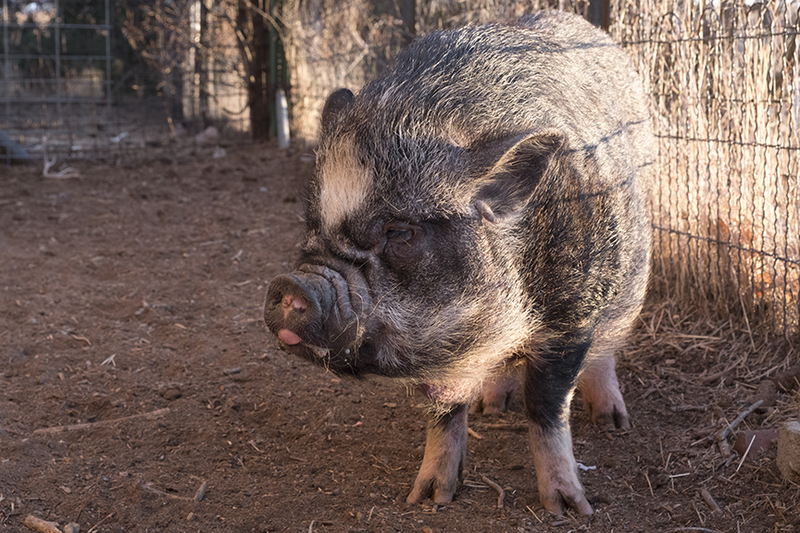 Truffle arrived at Hog Haven Farm in 2015 as a long-term boarding pig. Her owners, Dasha and Tara, had provided her a very loving home, but lived in a condo–not an ideal environment for a pig! After some discussion with her owners, and after Truffle bonded to Chopper, we decided to offer her a permanent place at Hog Haven. 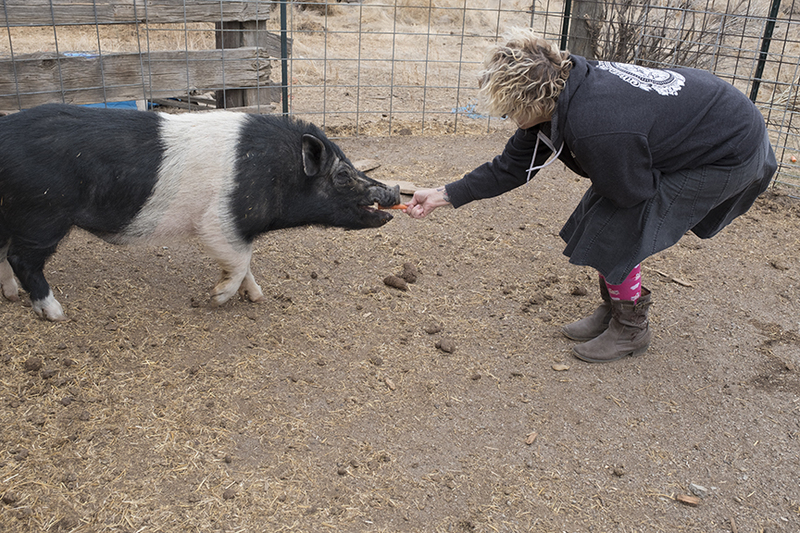 Truffle was a bit neurotic in her early months at the rescue, but now is a very friendly, social pig that greets visitors and gladly accepts treats. Her owners keep in touch with her, and sponsor her so she can stay at the farm.